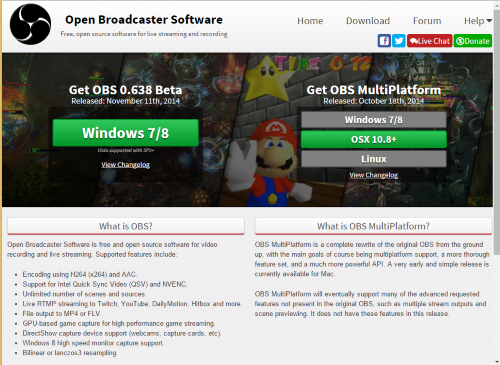 Although aimed primarily at a video game crowd to help in recording and streaming gameplay, Open Broadcaster Software (OBS) is also one of the best free software programs for screencasting. However, when it comes to operating its interface, it can be a little confusing. It isn’t always as clear how to select a source or setup the necessary options for screencasting. The purpose of this guide, then, is to help that issue and show how to prepare OBS. To start, visit the website and download the software. 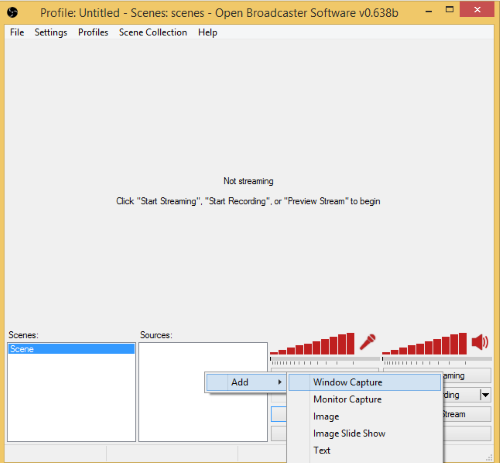 After installing and starting the program, you will have options to creating scenes and sources. 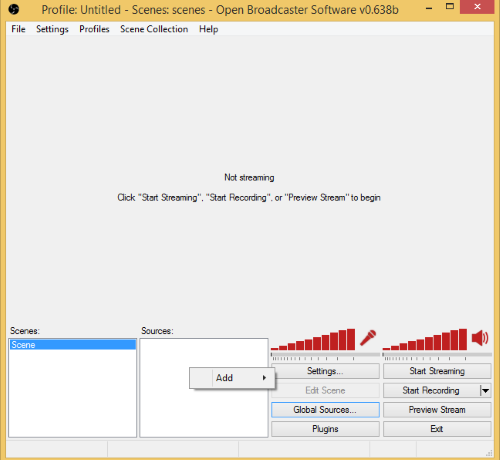 In OBS, Sources is a listing of the individual settings for each source (Monitor, Window, Image, etc). Through creating a new source, you can change the options for just that source without interfering with settings for any other source. Scenes, on the other hand, are collections of sources. If you want to handle a selection of sources at a time, you can add sources to one scene or another and separate their placement or options as needed. To add a source, right-click within the Sources area. This will own a context menu and allow you to pick which type of source you want. 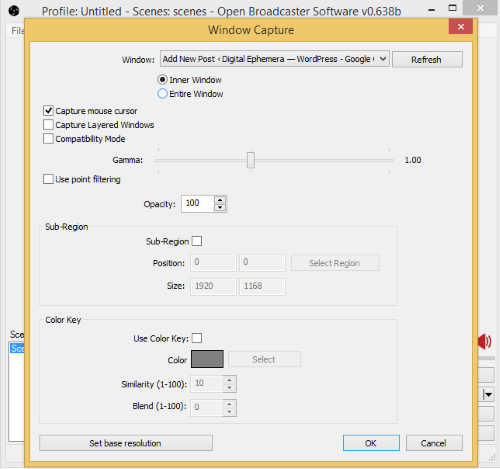 For most screencasting purposes, selecting a source of “Window Capture” will be the best choice. From the Window Capture window, you can set the options for this source. Using the drop-down “Window” menu, for example, you can select which window you would like to capture. Once configured correctly, click on “OK” to save those settings and create the window capture source. 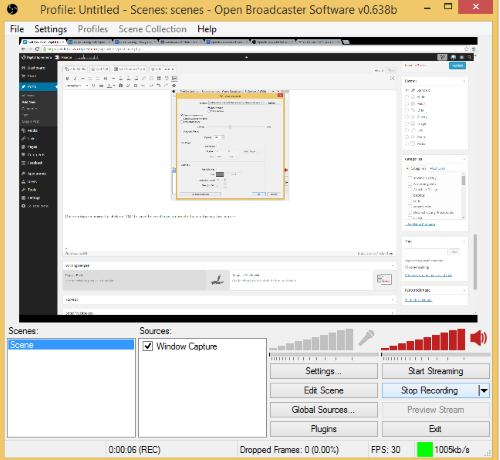 Once there is at least one scene and one source, OBS can begin to record. 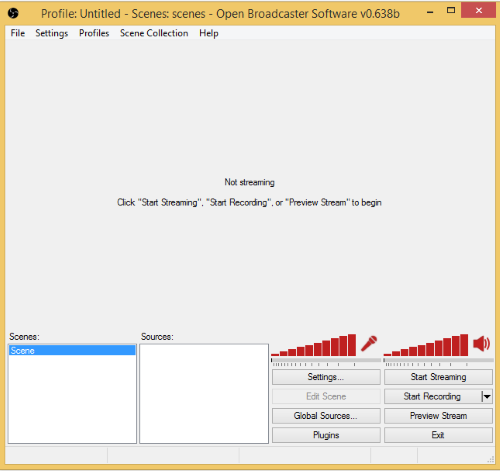 To do that, click on the “Start Recording” button on the lower, right-hand side of the window. As OBS is recording from a source, it will list the time, dropped frames, frames-per-second (FPS), and data speed within the status bar at the bottom of the window. To stop the recording, clicking on the same button, now labeled “Stop Recording,” will stop the recording and save the file. 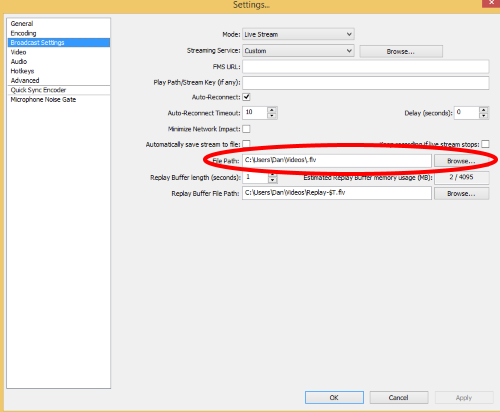 To find the file path to where recordings are saved, click on “Broadcast Settings”. On the right-hand side, towards the bottom, will be the “File Path” field. This will be recordings will be saved and can be changed using the “Browse” button next to this field. 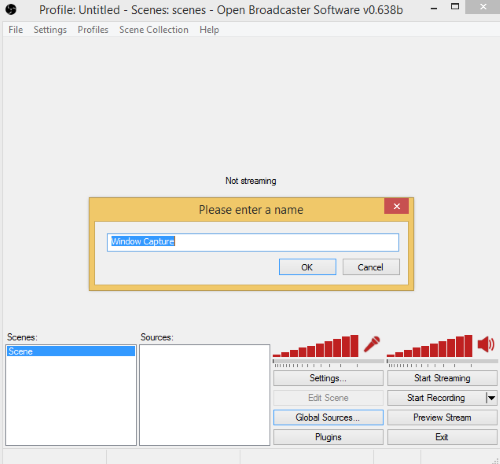 If you experienced problems or failed to record from the correct audio source during a particular session, checking to see if OBS is using the right source can often resolve this issue. From the Settings window, select Audio from the left-hand listing. 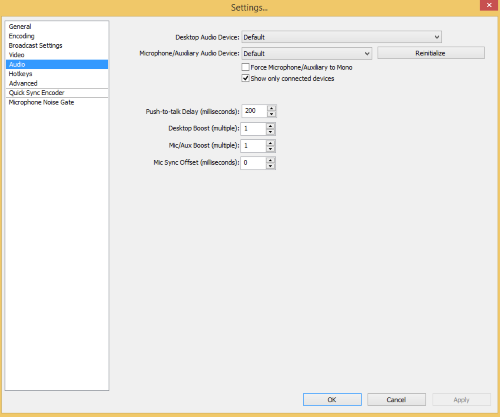 Using the drop-down menus for “Audio Device” and “Microphone/Auxiliary Audio Device,” select the correct source. 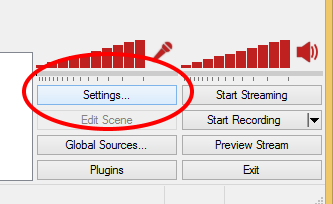 To save this setting, click on “OK” to close the window and use that option for the next recording.